Mindfulness meditation can result in improved brain function, reduced stress and self-healing, according to the keynote speaker for Western University of Health Sciences’ 10th annual Dr. Philip Pumerantz Distinguished Lectureship. 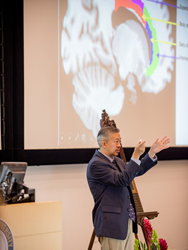 The lecture, held Sept. 20, 2018 in Pomona, California, featured Yi-Yuan Tang, PhD, Presence Fellow for the Center for Advanced Study in the Behavioral Sciences at Stanford University and Presidential Endowed Chair in Neuroscience and Professor of Psychological Sciences and Internal Medicine at Texas Tech University. Tang offered an overview of Integrative Body-Mind Training (IBMT), which stresses no effort or less effort to control thoughts, and the achievement of a state of restful alertness that allows a high degree of awareness and balance of the body, mind and environment. Tang’s research has shown IBMT improves attention, creativity, self-regulation and immune function, and also reduces stress. Conventional medicine models give patients the mindset that their physician should fix their problems and give them their health back, but this is not a positive, responsible, engaged mindset, Tang said. A better model is to combine conventional treatment with self-regulation of our body, mind and behavior, emphasizing our own responsibility, awareness and care action to maintain health, he said. Mindfulness is nonjudgmental attention to experience in the present moment, which sounds abstract, Tang said. IBMT is found to induce self-directed neuroplasticity change in structure and function of the brain, Tang said. “This self-directed neuroplasticity refers to the regulation of our own neural network activity through improving effortful and effortless self-regulation or self-control processes,” he said. Training a person’s attention/self-control network is important. In a randomized clinical trial, subjects received IBMT training therapy 20 minutes per day for five days. The training improved attention significantly. Negative emotions – anger, confusion, depression and fatigue – went down and positive emotions – vigor and activity – increased. In separate studies, IBMT resulted in more efficient processing of information between the two hemispheres of the brain, and even reduced cravings and tobacco use in smokers. “Everybody has the capacity to self-heal and to self-rehab, so the patient and physician need to work together to have integrated health,” Tang said. WesternU President Daniel R. Wilson, MD, PhD, asked the audience to join him in thanking Dr. Elaine Sarkaria. The lecture is endowed through the generous support of the Sarkaria family.